The entire motive power roster of the Arkansas & Ozarks strike a perfect pose at Junction, Ark., on November 13, 1954, in their factory paint. 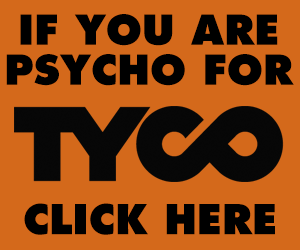 Sometime in the mid-1950s the pair were repainted and re-lettered. In its first year, A&O owned and used a Ten-Wheeler (4-6-0 No. 20) to pull work trains out of Harrison as the line was being reopened. On the Arkansas & Ozarks, Junction was the unimaginatively-named location where the branch to Eureka Springs left the main. For predecessor Missouri & North Arkansas, it was the spot from which the “new line” southeastward to Harrison and Helena was built. Kodachrome by Harold Henre, collection of Jeff Cooney. When the 359-mile Missouri & Arkansas Railway was approved for total abandonment on April 6, 1949, it would be the largest railroad abandonment in U.S. history, until that of the infinitely more well-known New York, Ontario & Western in 1957. To those who even noticed it must not have been a surprise. After all, the M&A was just a reincarnation of the Missouri & North Arkansas Railroad, a road of identical footprint that had itself failed only a decade before. And other nearby midwestern regional lines had also been completely abandoned including northern Missouri’s Quincy, Omaha & Kansas City RR (250 miles) and Fort Smith & Western (217 miles), both in 1939. Thus, the idea that an entire railroad could simply be scrapped was not entirely unheard of even in the 1940s. The M&A (and M&NA before it stretched from Helena, Ark., to Joplin, Mo. ), had two improbable endpoints chosen in hopes Helena would emerge as a major Mississippi River port city and connection with Joplin’s many railroads would bring success. The line came into being in 1880 when demand for better transportation to the burgeoning resort town of Eureka Springs, Ark., prompted investors to start the Eureka Springs Railway to build to a connection with the St. Louis & San Francisco Railroad (Frisco) at Seligman, Mo. The Eureka Springs Railway was merged into the St. Louis & North Arkansas in 1899 and the line extended west to Joplin, Mo. The road was pushed eastward to Helena after a 1906 reorganization as the Missouri & North Arkansas Railroad. The railroad was treasured by on-line communities, but went from “nowhere to nowhere.” Memphis eclipsed Helena as the major gateway of the region, and nearly all of the connecting rail lines at Joplin became minor branches. The route chosen, along with poor country, highway competition, labor troubles and absentee ownership were factors in the demise of both M&NA and M&A. The company purchasing the M&A for scrap was New York-based H.E. Salzberg Co. 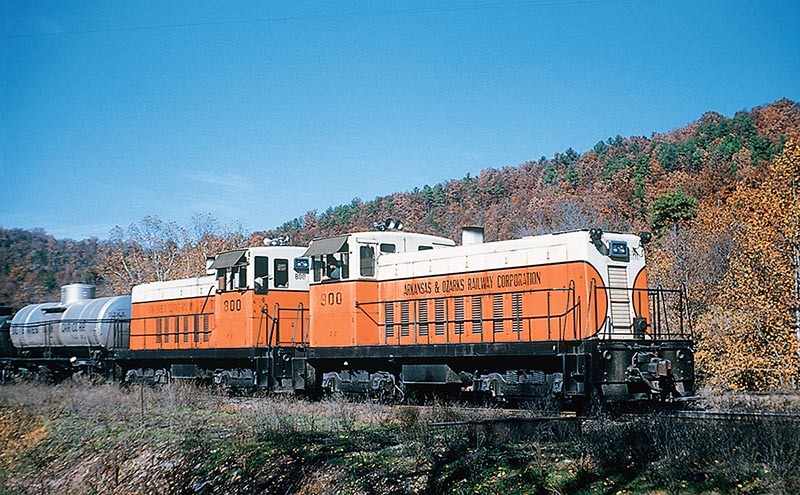 They were known as a railroad salvage firm, but were also a part of an investor group holding several shortline railroads such as the Wellsville, Addison & Galeton; Fort Dodge, Des Moines & Southern; and Unadilla Valley. 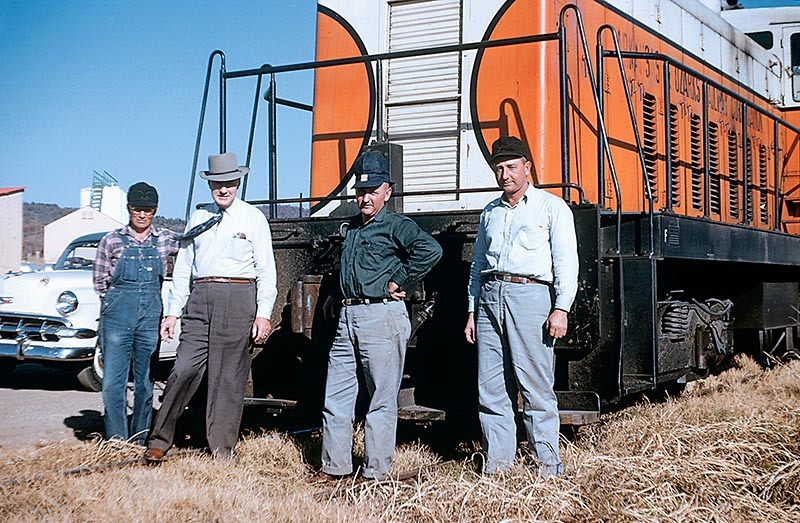 It was under these circumstances in 1949 that the Arkansas & Ozarks Railway was conceived. With assurances of traffic from northwest Arkansas communities the Salzbergs decided the 66 miles between Harrison and Seligman might be viable. Harrison, with a 1949 population of around 5,500, was the seat of Boone County and a good generator of traffic on the former M&A. With no railroad service since M&A operations ended in September 1946, business and city leaders eagerly petitioned for reinstatement of service. The Harrison-Seligman segment was a tough route. It included the line’s only tunnel, a dozen grades of 1.75% or more, and a steep 2.6% grade through Butler Hollow in Barry County, Missouri, into Seligman, whose Frisco Railway connection would serve as A&O’s outlet to the rest of the world. Other notable features included the two-mile spur to Eureka Springs and a three-mile branch to Berryville, Arkansas, with a complete loop at the end of that spur. An enormous notch known as “The Narrows” was cut into the rock wall at the east end of the White River bridge at Beaver, Ark., was once a regional attraction itself and noteworthy enough to be regularly featured on M&NA passenger timetables. While most of the M&A was scrapped, the Arkansas & Ozarks was rehabilitated with most material coming from that salvage. Managing the new railroad was Jack Halter, who like most employees was an M&A alumnus, having started with the M&NA in 1910 at Searcy, Ark. 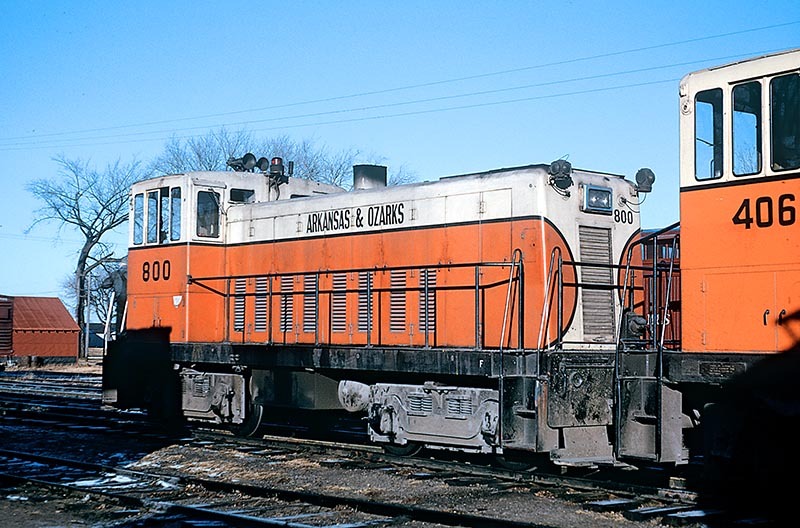 Service would be freight-only, powered by two 70-ton General Electric diesel locomotives. Ballast was mostly dirt. Three-man non-union crews would be used, with a fourth crew member added for trains of over 23 cars in compliance with Arkansas law. No station agents were employed; instead, a traveling agent called on customers via automobile. The A&O was based out of the wooden station building in Harrison and began with 38 employees. The first revenue train arrived in Harrison on Friday, February 3, 1950, at 7:00 p.m. with two cars: one with fir lumber for Hammerschmidt Lumber Co., the other with coal from Henrietta, Okla., consigned to Roy Kershaw, Co. It was the first train into Harrison in three-and-a-half years. The Arkansas & Ozarks was profitable though the early 1950s. Inbound traffic included building materials, animal feed, petroleum products and general merchandise. 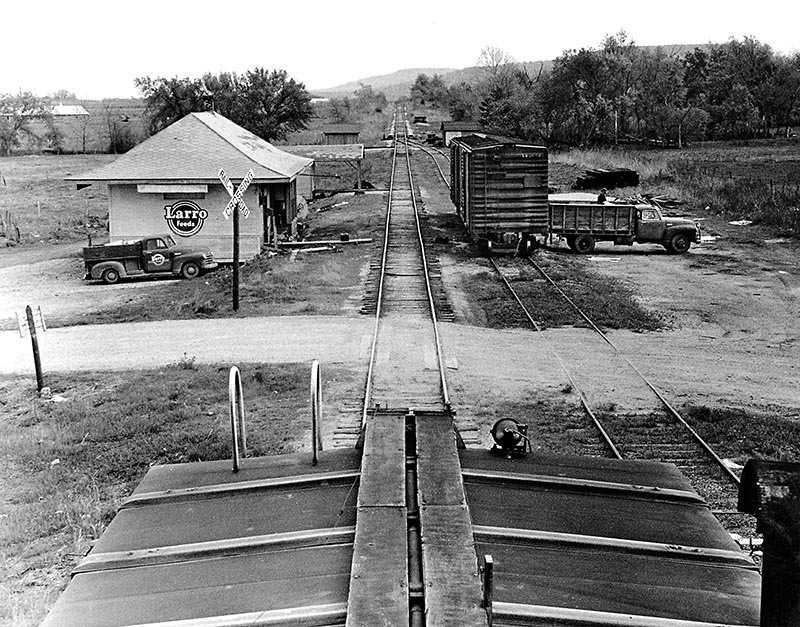 Carloads delivered to the Frisco included logs, railroad ties from Harrison and other wood products, processed poultry from Berryville, berries and produce, drinking water from Eureka Springs and grain. Operations generally consisted of three two-day round-trips to Seligman each week, the crew plugging in for electricity and bunking in the caboose overnight at the north end of town. Northbound trains often “doubled the hill” into Seligman, leaving half of the train at Pender Switch, deep in the heavily forested Butler Hollow just north of the state line, while the two GE’s fought the grade with the other half to Seligman. Deep in the valley carved by Butler Creek, Pender was neither a town nor a settlement. It was rather, “just a siding in Vernon Gemmecke’s backyard,” wryly recalled one Barry County native. By 1954 indications were that the Salzbergs were losing interest in their little Ozarks short line. Flooding was a recurring problem, and their return on investment was not as good as they had hoped. Revenues declined as shippers switched to trucks, and the railroad started losing money. The owners found a way out in 1959 when the U.S. Army Corps of Engineers condemned a small portion of Arkansas & Ozarks right-of-way for its proposed Table Rock Lake. The Salzbergs could have likely gotten the Engineer Corps to elevate the affected segment of track, which was routine in such situations, but instead claimed the condemnation had severed the line. They proposed the Corps either take over the Arkansas & Ozarks or construct a brand new nine-mile connection from Harrison to the Missouri Pacific Railroad at nearby Bergman. Whatever the remedy, the Corps was surely not eager to pay the estimated $600,000 – $1 million to raise the 2.7 miles of track an estimated nine feet to remain above flood level for the new lake, nor build the MP connection. 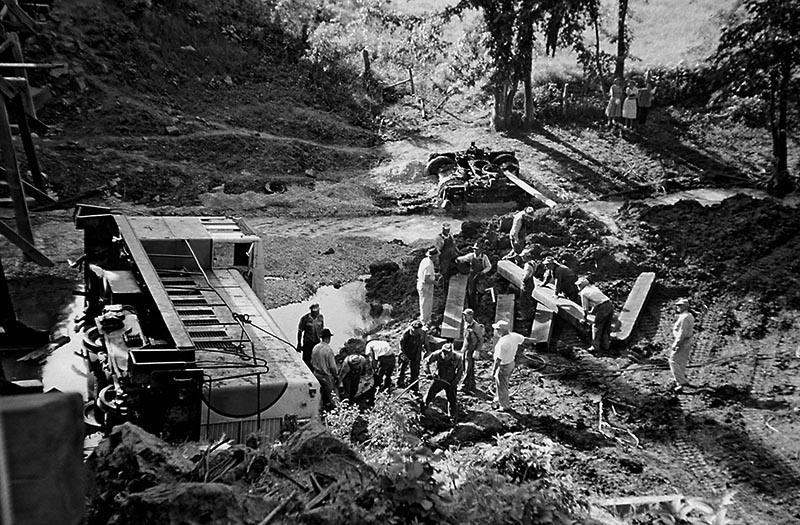 Down to 19 employees by 1959, the A&O continued operating until May 5, 1960, when heavy rains in northwest Carroll County, Arkansas, washed out a trestle and damaged track for several miles around Leatherwood Creek. Inbound traffic was embargoed and 51 cars from other railroads were stranded. A&O’s owners filed to abandon on June 9, 1960. A “shoo-fly” embankment and temporary track was constructed around washed-out trestle number 75-7 between Junction and Beaver, Ark., and on July 7 the 51 cars were moved out with the assistance of a St. Louis-San Francisco engine brought down from Seligman. Before the ICC, the Salzbergs testified the A&O had lost $235,547 from 1955 to 1960. At the ICC’s insistence, the line was offered for sale at fair net salvage value, but no buyers came forward and abandonment was authorized on April 7, 1961. The two stranded orange and cream General Electric 70-tonners in Harrison were taken by low-boy trailers over Highway 7 to Bergman where they were placed on Missouri Pacific rails for delivery to the Fort Dodge, Des Moines & Southern. It is interesting to note the estimated repair costs for the 1960 flood damage was $12,000. Compare that to the $720,000 the Arkansas State Highway Department was soon considering spending to convert a portion of A&O right-of-way through Harrison into a highway. Today, tourist line Eureka Springs & North Arkansas operates the re-laid two-mile Eureka Springs spur and uses the handsome cut stone 1914 station building. Other surviving relics include the cinder-block diesel house at Harrison, the Urbanette depot (relocated to Green Forest), the relocated depot and steel through-truss bridge over the White River at Beaver and a few wooden trestles. Much of Farm Road 2285 lies atop the old A&O grade through Butler Hollow, as does Old Railroad Road though Batavia. 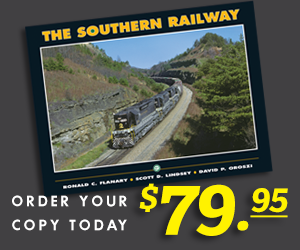 For ten years this storybook short line went about its business in the beautiful and rugged Ozark mountains of Arkansas and Missouri, trying to survive where predecessors failed. 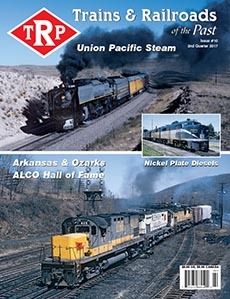 The Arkansas & Ozarks Railway ultimately joined them in obscurity as locally-beloved railroads that came and went largely unknown to the outside world. This article appeared in the 2017-2 issue of Trains & Railroads of the Past. Order your copy today!